Meet Veronica! Like her namesake, Veronica Lake, this mature lady is known for her lovely hair! 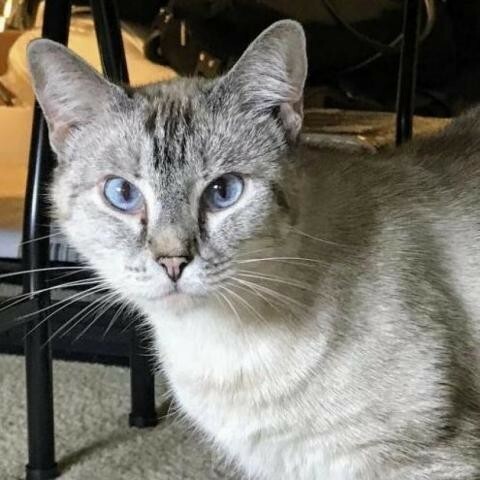 This gorgeous Siamese mix will greet you at the door when you come home and beg for the pets to which she knows she is entitled. Veronica is a very mellow cat who enjoys hanging out with and watching her sister, Betty, climb their cat tree. Because Veronica and her sister came from a hoarding situation with bad conditions, they are learning what it's like to live in a stable, loving home environment. Veronica is bonded with her sister Betty, so they must be adopted together. Is there room in your heart for Veronica? And Betty? All Dallas Pets Alive adoptable pets are spayed or neutered, microchipped, and up to date on vaccines upon adoption. The standard minimum donation for cats over six months to seven years is $100, kittens under six months are $150, cats eight years and over are $50 unless specified otherwise. You can view all the adoptable pets and fill out an adoption application online on our website at http://dallaspetsalive.org/adopt/adoptable-cats/ For more information, you can email adopt@dallaspetsalive.org.